The site was examined in 1993 during the erection of the Attaturk Dam. 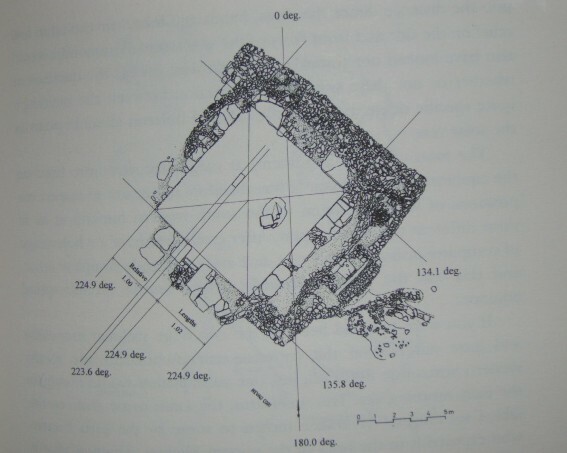 Excavations were conducted by a team from the University of Heidelberg under the direction of Professor Harald Hauptmann. Together with numerous other archaeological sites in the vicinity, Nevali Cori has since been inundated by the dammed waters of the Euphrates. This site, together with numerous others in the vicinity are now underwater and no longer visible. (Various remains, including the monolith are now on display in the nearby 'Urfa' museum). The site of one of the oldest carved monoliths in the world. The temples were lost when the Ataturk dam was established and flooded the area. The central cult building has been carbon dated to 8,000 BC, and consisted of a temple built with 13 stone uprights in the walls, and with an enormous monolith in the centre (once a pair). 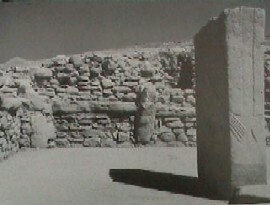 The design of the temple has been compared to the Kalasaya at Tiahuanaco, Bolivia, while the hands on the monolith are reminiscent of those on the Easter island statues. In terms of absolute dates, 4 radiocarbon dates have been determined for Nevalı Çori. Three are from Stratum II and date it with some certainty to the second half of the 9th millennium BC, which coincides with early dates from Çayönü and with Mureybet IVA and thus supports the relative chronology above. The fourth dates to the 10th millennium. The local limestone was carved into numerous statues and smaller sculptures, including a more than life-sized bare human head with a snake or sikha-like tuft. Some of the pillars also bore relief's, including ones of human hands. The free-standing anthropomorphic figures of limestone excavated at Nevali Cori belong to the earliest known life-size sculptures. Comparable material has been found at Göbekli Tepe (Currently considered to be the oldest temple in the world at c. 9,500 BC). Several hundred small clay figurines (about 5 cm high), most of them depicting humans, have been interpreted as votive offerings. They were fired at temperatures between 500-600°C, which suggests the development of ceramic firing technology before the advent of pottery proper. - The corners of the main 'cult' building are aligned cardinally, leaving the temple facing almost exactly SW. The monoliths inside (originally there were two), were both orientated so as to face out of the building and along the Euphrates river. Nevali Cori is suggested by Collins (1), to be orientated towards Giza, 1080 Km away. 1). A. Collins. Gods of Eden. 1998. Headline book Publ. 3). B.G. Sidhartha. The Celestial Key to the Vedas. 1999. Inner Traditions Publ.